I don’t really know why my wife and I decided to go to Mokpo. I’ve heard good things, and some bad things. To be honest, my expectations weren’t that high. I just wanted to get out of the city for a bit, and get some fresh air by the sea; which was accomplished the second we step off the KTX into Mokpo Station. As anyone who has spent a considerable amount of time in Korea knows, heading anywhere in July is hit-or-miss with the weather. We took our chances, and for the most part, it was rainy, but there still was that fresh sea air that filled our lungs, instead of the dead smog that hangs in the city. We left Seoul around 1130am and arrived in Mokpo at 130. We had a plenty of time to mess around and explore the city. On this note, I would like to say how much I appreciate the cheap and cozy KTX, the Korean high speed railway network. I have never had a bad experience, and it is responsible price (38k to Mokpo). Any traveller who is looking for a cheap and easy way to move around Korea, I would high suggest this mode of transportation. My only qualm with the KTX is that you must order the tickets online using Internet Explorer (Sorry Mac users). There is also an English speaking customer service line if you need help booking your ticket, or you don’t feel comfortable booking online. We decided to stay at the F1 Hotel, recommended by Lonely Planet. The F1 is located on the southern end of town, between the ferry terminal and bus terminal. It is a large, black building with an orange sign on top that says “F1”. It was in walking distance from the station, but since we had a tough time locating it, we took a cab, which ended up only being a 2 minute cab ride. We felt kind of dumb. Lonely Planet Description: The best accommodation between the train station and the ferry terminal is the dark high-rise. Modern, clean rooms have sofas, heated toilet seats and ultrafast PCs. Derek’s Review of the F1 Hotel: Lonely Planet was pretty spot on with this description of the hotel. 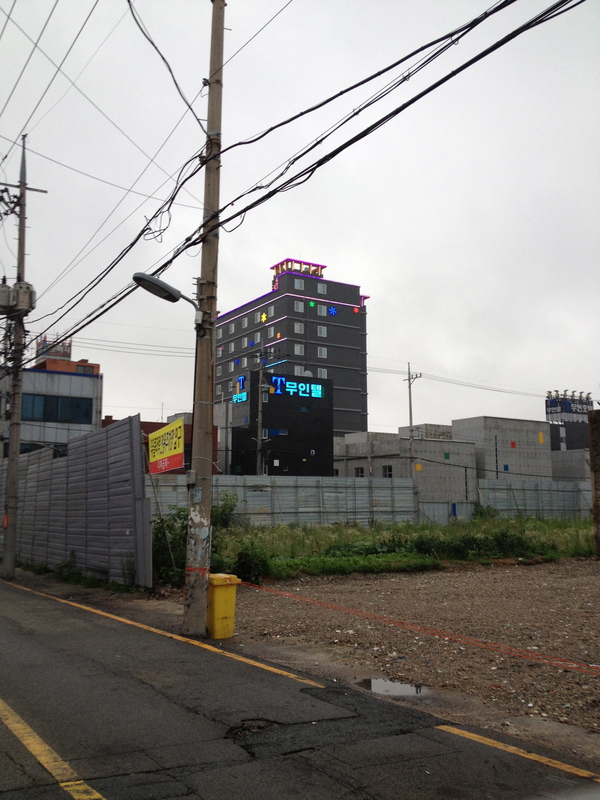 It is a clean, modern love hotel, and is right in the middle between the ferry station and the train station. Location: The location of this hotel is dependent on the traveller. For myself and Jill, it was good because it was close to the train station, and also we had delusions of heading over to Hongdo, so we wanted to be close to the ferry station. If you are a young couple, or single and looking to party, I wouldn’t recommend this hotel. If you want a nice, clean place, than it is great. One aspect about the location, is that it is not near anything that single travelers would consider “fun”. There are no bars or clubs nearby. There are no restaurants or malls. There are a number of independently own fish places near the hotel, so if you are feeling adventurous and want to tackle a live octopus, you could consider this hotel. Service: The clerk at the counter didn’t speak any English. I didn’t expect much, but it is always a nice surprise when they do. The clerk checked us in. We had to carry our own bags. Not rude, but not welcoming. Rooms: Rooms were standard Korean size, and nice and clean. We had two double beds, which were comfortable. The mattress was solid, nice and firm, and it was cleaned every day when we went out. A nice big, flatscreen television and an excellent bathroom with (yes!) 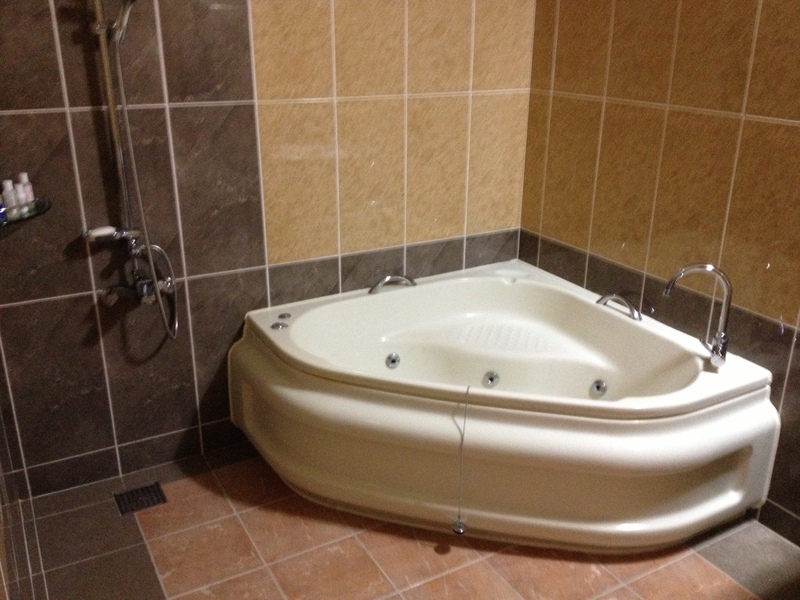 heated toilet seats and a jacuzzi bath! There is nothing more calming than taking a number 2, while you cheeks are warm slowly on the porcelain throne. 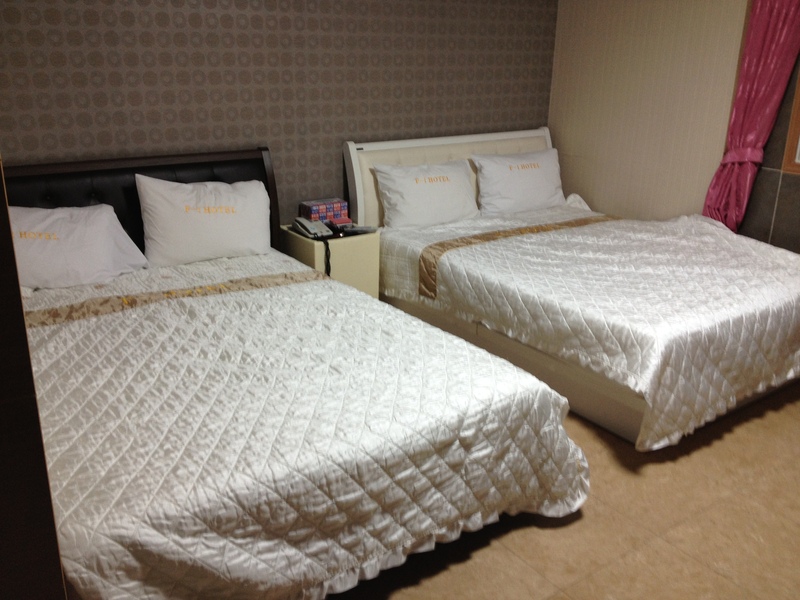 Value: For the high season, in the middle of Mokpo, this hotel was a pretty good value. My only qualm was with the location, but the facilities were great and we really enjoyed our stay. The clerk could have been a little warmer, but for 60k/night in the holiday season, we weren’t complaining. I don’t know if I would stay here again though. My wife and I would have liked to see a bit more of the Hadang nightlife area, and I think we would probably check in there on a return trip to Mokpo. Standing tall in-between the ferry station and the train station, amongst countless seafood restaurants.